The mr16 has a 50mm width across the face where the Mr11 is 37mm diameter. These are used for led reading lights and interior lights in caravans, RV and at home. MR11 Led replacement bulb for boats, caravans, campers, Rv and cabinets This is a direct fit for yo..
You are buying one Mr16 led bulb with 15 high power led chips mounted on it. 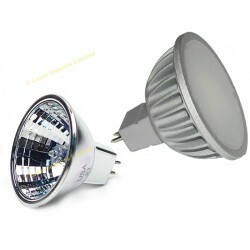 This is now the 5W ver..
You are buying one Mr16 led bulb with 15 high power led chips mounted on it. This is not 5W 380 Lum..